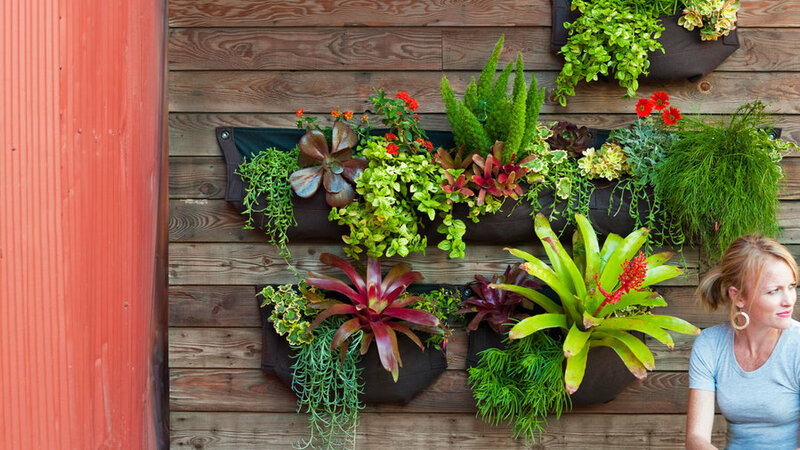 A vibrant jungle thrives on this San Francisco wall, designed by Flora Grubb Gardens (415/626-7256) using Woolly Pockets. Made from recycled plastic bottles, the pockets are filled with soil, planted, and hung. Greenery keeps hydrated and water doesn’t leak because the pockets are lined with moisture barriers―they can be used indoors too. Close-up of a Woolly Pocket. Info: From $49 for the Wally One (24 in. long, 15 in. high); from $125 for the Wally Three (68 in. long, 15 in. high). Available in San Francisco and online from Flora Grubb Gardens (info above), at Pigment in San Diego (619/501-6318), and at Digs in Portland (503/460-3447). 1. Hang Woolly Pocket by its grommets, then fill it two-thirds with spongy, fast-draining soil and add 4- to 6-inch plants. 2. Use aeoniums, geraniums, bromeliads, and Sprenger asparagus ferns for their low-maintenance; quicker-growing geraniums and asparagus ferns will need to be repotted eventually. 3. Watering needs depend on the plant; see instructions at woollypocket.com. Pictured: $272, not including plants.